May 2, Rochester, NY - Bark once if you are looking for better technical support for your optical instrumentation company. Semrock has hatched a new B2B campaign to explain the true personality behind the team at Semrock who brings their high level of optics knowledge, dedication, and problem-solving attitude to the business on a daily basis. Or in pursuit of that fly ball. Semrock, Inc., a Unit of IDEX Corporation’s Optics & Photonics platform, manufactures high-volume optical filters that set the standard in performance and reliability for the biotech and analytical instrumentation industries, as well as innovative optical filters for more general laser and optical systems applications. 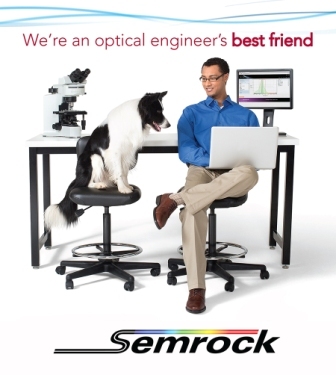 All Semrock optical filters are made with hard ion-beam-sputtered optical coatings. OEM filters are manufactured in volume. End-users benefit from a wide selection of standard catalog products that ship from stock. Semrock’s patented and patent-pending products include its highly acclaimed BrightLine® fluorescence filters, state-of-the-art filters for Raman spectroscopy, and other unique filters for lasers and optical systems. Semrock’s innovative products, made possible by combining modern sputtered coating techniques with Semrock’s proprietary volume manufacturing technology, are covered under a five-year warranty. Founded in September 2000, Semrock is based in Rochester, New York, a well-known center of optics, and has sales offices throughout the United States. In October 2008 Semrock became a Unit of IDEX Corporation. For additional information about Semrock, its products, and team of international distributors, visit the company website at www.semrock.com.